If there’s one thing that all Urban Hippies can agree on, it’s that there’s nothing quite like a good haul of fresh produce, preferably bought from someone who had a hand in growing it nearby. And with September upon us, now’s the time to take advantage of the abundance of local fruit and veg that’s pouring into the city before the snow flies and we’re relegated to whatever lesser-tasting specimens will be gracing the grocery store shelves come winter (c’mon, we all know those winter tomatoes from distances away just don’t taste anything like an actual tomato). We say, hit the farmers’ markets now and get your fill — and dare we say, you might even try your hand at preserving some of the current bounty to enjoy months from now? 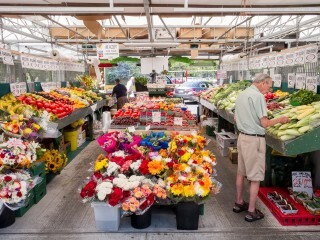 Parkdale Market offers local fruit and veg, as well as fresh cut flowers. Photo by Justin Van Leeuwen. One of our go-to favourite outdoor market is one of Ottawa’s oldest: The Parkdale Market began peddling wares in July 1924, and now has 29 vendors offering up fresh fruit and vegetables along with cut flowers. It’s kind of a no-fuss, no-muss kind of place — what you see is what you get, not too many frills or fancy-shmancy stuff. And we kind of love it for that. That said, if you’re looking to supplement your veggie haul, take a stroll through the Savour Ottawa Field House (located just beside the market), which offers such local treats as goat cheese, frozen meats, eggs, and honey. At the Parkdale Market, one can conjure the line connecting us to 1924 — the sense that when we buy the veggies to go into that aromatic, warming, autumn stew (or, if you’re the Urban Hippie and her dad, the fixings for Grandma Lahey’s recipe for chow-chow relish — sorry, can’t provide the recipe, strictly a family secret), we’re actively participating in Ottawa’s history. While cars whizz past nearby, and condo developments spring up willy-nilly in the surrounding neighbourhood, we can imagine the market itself as was when it first opened: people who grew food offering it for sale at decent prices to customers who wanted something straightforward to add to their diet. In today’s sea of pre-packaged, overpriced, processed, unidentifiable-ingredient-crammed foods, the browsing/smelling/touching/buying of fresh produce from a farmers’ market is a slow, deep breath that connects us to a time when fresh, no-frills food was pretty much all there was. And if that sounds a little bit nostalgic, well, maybe it is. But with apples, root vegetables, beans, Brussels sprouts, cabbage, carrots, cauliflower, cranberries, corn, kale, garlic, onions, peas, tomatoes, herbs, and more all in season right now, why not take a trip to the Parkdale Market, nourish yourself with the taste of Ottawa’s history, and make the connection between what was and what still is, all the while making the chore of food shopping that much more fun and delicious. Parkdale Market is located on Parkdale Avenue, just north of Wellington St. W. Open daily, 6 a.m. to 6 p.m.